BELIEVER! Collection vol.3| RPG Maker | Create Your Own Game! 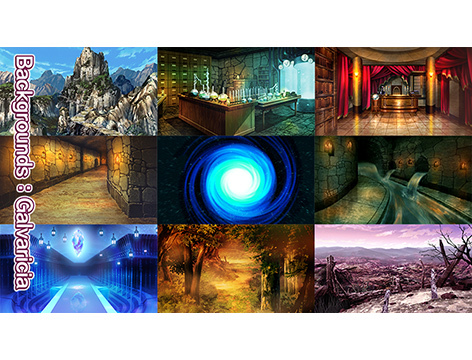 Explore the castles and forest of the parallel world and bring a touch of danger to your Visual Novel Maker projects! Once every thousand years, a portal opens to a parallel world and strange creatures invade and threaten Earth. But a group of guardians will rise to protect our daily lives, while tackling battles, romance, love and interpersonal relationship. This is the world of「Believer!」, a beloved visual novel released by D3 Publisher. 「Believer!」Collection is a 3-part series of stunning graphics - including both unique characters and gorgeous backgrounds. Now you can bring the marvelous 「Believer!」 world to your non-commercial VNM projects! Volume 3 is all about the Outer world of Galvaricia and its denizens. Explore the castles and forests of the parallel world and bring a touch of danger to your VNM projects. With 11 expressions for each of the 6 characters and 18 exciting locations to explore, you're sure to be inspired for adventure, betrayal, romance and more! Spanning across all 3 volumes, there is a total of over 3800 character illustrations and 68 backgrounds that are waiting to be used. Whether you're looking to craft a novella set in the 「Believer!」 world or simply wish for stylish graphics to illustrate an original love story, you can't go wrong with 「Believer!」 Collection! 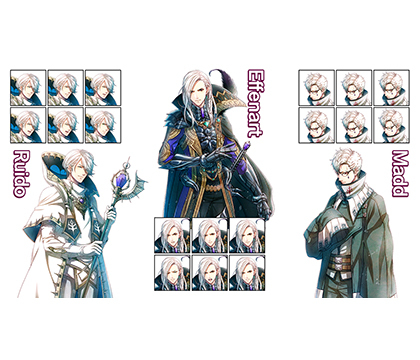 All characters come with 11 expressions. Most of these 11 expressions have 2-4 patterns as detailed expressions for animations, such as "openeyetaiki" for Idle expression talking with eyes open, "openeyekaiwa" for Talking expression with eyes open, "closeeyetaiki" for Idle expression talking with eyes closed, "closeeyekaiwa" for Talking expression with eyes closed. ※This content use is subject to the Believer! Collection resource EULA, please check before use.